Freshly brewed filter coffee on demand. 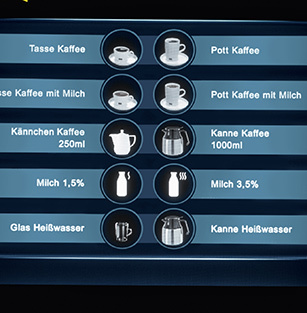 Up to 500 cups/hour + hot water for the perfect cup of tea + fresh milk for coffee and milk combinations or a delicious glass of milk on its own. Melitta® Cafina® XT8-F - Programmed for fresh filter coffee. 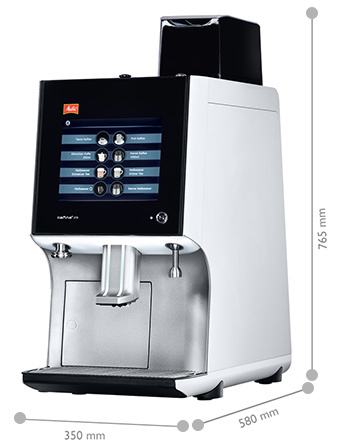 Refined aluminium housing (anodised and shot-blasted), ergonomic control panel with robust glass panel and 10.4′′ multimedia touch display, LED lighting concept. 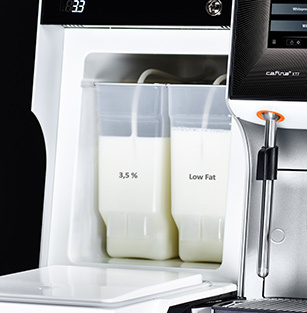 Compatible with all XT cup warmers, milk coolers and billing systems. For convenient operation, versatile programming, film and photo display. Separate dispenser for large pots: swivelling arm, length 180 mm or 500 mm. One or two types of fresh milk from the refrigerator for coffee and milk combinations or a delicious glass of milk on its own. 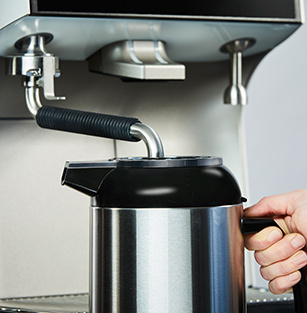 The look of the Melitta® Cafina® XT8-F underlines the high technical quality and state-of-the-art, and fits in both technically and visually with the familiar modules of the XT range.